Between 1951 and 1957, Herb Flam was ranked in the World’s Tennis Top Ten four times. His highest position was number five in 1957 World Tennis magazine. From 1948 to 1958, he ranked in the United States Top Ten (except 1953 and 1954, when he served in the U.S. Navy), reaching the number two spot in 1950, 1956, and 1957. Flam first gained attention in 1943, when he won the U.S. Lawn Tennis Association (USLTA) Singles Championship as a 15 year old. As a Beverly Hills High School junior in 1945, he captured the USLTA Interscholastic Singles and Doubles (with Hugh Stewart) titles. The pair repeated their Doubles success in 1946.
when he entered the USLTA Singles Championships unseeded and reached the tournament semifinals, en route defeating the third and sixth seeds. The achievement earned the 20-yearold University of California at Los Angeles undergrad a number nine U.S. ranking. 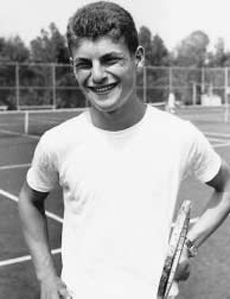 In 1950, the year he won the USLTA Intercollegiate Singles and Doubles with Gene Garrett, Flam reached the finals of the U.S. Singles, becoming the first Jewish tennis player ever to advance to the championship round. (He lost to Art Larsen in five sets.) Nonetheless, Flam won the U.S. National Clay Court Singles that year and teamed with Larsen to win the Clay Court Doubles crown as well. Flam reached the Wimbledon Singles semifinals in 1952 and made the English grass court’s final eight three times. Flam reached the quarterfinals of the U.S. Singles six times. Upon his return to competitive tennis from Navy service, Flam won the 1955 U.S. Hard Court Championship. A year later, he won his second U.S. Clay Court title. Competing in his first Davis Cup matches for the United States in 1951 and his last in 1957, Flam won 12 of 14 matches. The International Tennis Association elected Flam to the ITA Collegiate Tennis Hall of Fame in 1987.